Welcome to FABBYLIFE: DVF chain-neck dress, Theory leather sleeve blazer sale! You Are Here: Home - Deal - DVF chain-neck dress, Theory leather sleeve blazer sale! DVF chain-neck dress, Theory leather sleeve blazer sale! DVF giada chain-neck red dress ﻿was $398, and is $139, here. This dress also comes in black at a different price, here. 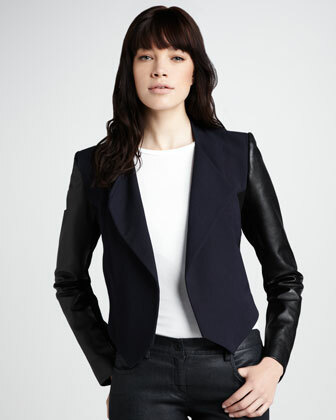 Theory leather sleeve blazer was $555, and is $194 at NM, here.